A “grey wave” is advancing on Canada. As the population ages, there are enormous challenges associated with helping older adults maintain their independence and quality of life. And it’s not just a matter of increasing health care dollars. We need to innovate, both technologically and socially, says Assistant Professor Josephine McMurray. 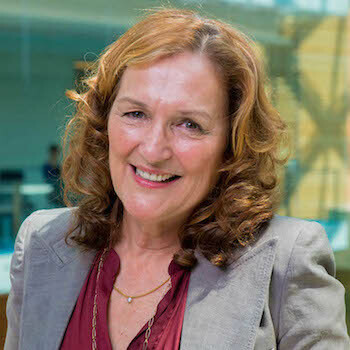 McMurray, a faculty member in the Business Technology Management program on Wilfrid Laurier University’s Brantford campus, researches business and policy issues related to using technology to support healthy aging. She’s in the process of developing recommendations to strengthen the “age-tech” sector in Canada. The demographic shift makes the need to innovate urgent, says McMurray, who is a member of the AGE-WELL (Aging Gracefully across Environments using Technology to Support Wellness, Engagement and Long Life) National Centre of Excellence, a major multi-institutional effort to support older adults and caregivers through technological and social innovation. By 2041, the number of seniors is expected to more than double compared to 2013, to make up more than a quarter of the population, says McMurray. By 2041, the number of Canadians over 75 will triple and the 90-plus cohort will increase more than four-fold. This matters because annual health-care spending rises from $11,557 per year at 75 to $20,917 for those over 80, according to the Canadian Institute for Health Information. Examples of assistive technologies to help older adults stay independent longer include wearable sensors that can help prevent falls and underwear that can help prevent bedsores. There’s an app that reminds people which medications to take and when; another enlarges buttons and text on smartphones. There are also innovations to help carers, ranging from digital medical informatics that help keep track of patient needs to robots that can lift patients. But given what’s often a huge generation gap between developers and users, it’s not just developing the technology that’s important, says McMurray, who holds three research grants as a principal investigator or co-principal investigator and is involved in several other projects led by others. One of McMurray’s postdoctoral fellows, Heather McNeil, is researching how to engage older adults early on in the technology development process, establishing their needs and interests and involving them in research and trialling products. On the macro level, McMurray says it’s important to have the right policies and procedures in place to create environments that encourage new technologies and businesses to flourish. McMurray leads the WEiRED (Women Entrepreneurs, Innovators, and Regional Ecosystem Development) research group and co-leads the DRiVE (Developing Regional health innoVation Ecosystems) research group. Both of these examine factors that lead to the development of regional research and entrepreneurship clusters, which can help drive innovation in the health and age-tech sectors. Policies and communities that encourage cluster development are ones that enable efficient development and deployment of new technologies while ensuring patient safety, help university researchers capitalize on what they develop, and allow companies to become profitable, says McMurray. Health and age tech “superclusters” consist of universities and research/teaching hospitals working with government, industry and local communities. Examples of these are in Boston, Massachusetts, and Cambridge, UK. However, there are also promising clusters in Canada, says McMurray. The MaRS Discovery District in Toronto, for instance, has a substantial number of people and programs focused on health innovation. The MaRS Excellence in Clinical Innovation Technology Evaluation (EXCITE) program works to connect health technology innovators with researchers and health system stakeholders. In addition, there are emerging innovation hubs in Ottawa and Fredericton, says McMurray. The hub in Ottawa deals with sensor-based technologies for monitoring and improving mobility for older adults. The hub in Fredericton examines policies and regulations with the aim of safely getting technologies for older adults to market more quickly. McMurray, who worked in radiography and health care administration before earning her MBA at Laurier, followed by a PhD at the University of Waterloo in public health and health systems, says her background allows her to understand the intersection of business, technology and health care. Her clinical experience taught her about the human side of health, she says. This is why McMurray is so keen to see effective innovation in the health sector. “The benefits of having people independent and aging in their own homes with the help of assistive technologies will trickle down,” says McMurray. “We’ll have fewer older adults in emergency rooms because they’ve had a crisis and don’t have the appropriate supports for aging at home.